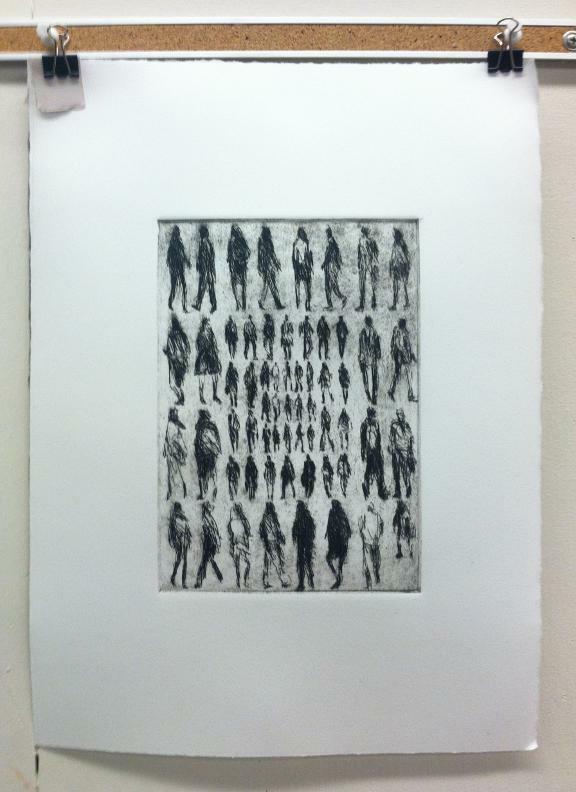 My first proof of 61 Pedestrians (Etching). I love to try new things, and it’s tempting for me to abandon everything I’ve learned each time I begin a project. Experience has shown, however, that starting anew isn’t always the best way forward. My art progresses the most when I select what I like about a piece or a series, keep that constant, and limit my variables. With that in mind, I decided that my first foray into zinc-plate etching should expand on something I’m already very familiar with — my Pedestrian Series (examples on my website). As the images in the series are line-based, I chose to work with a hard ground. That means I coated my zinc plate with a thin, brown layer of waxy “ground,” let it dry, and then carved my image into the ground with a stylus called a Whistler’s needle. The lines that I scratched into the wax exposed the shiny zinc plate below. I then set the plate in an acid bath so that the exposed lines were etched into the plate, while the waxy ground protected the rest of the plate. 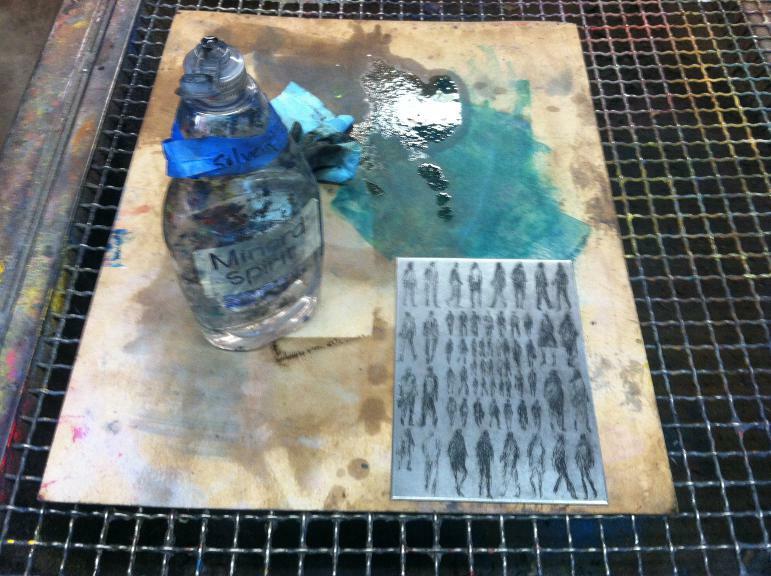 In the above picture you see my plate in the acid bath. The light figures are the places where I carved away the waxy ground with my Whistler’s needle, and the dark background is the ground. The reaction of the acid and the exposed zinc plate creates small bubbles that need to be brushed off with a feather, or else they’ll leave a small bubble pattern that will distort the lines. After etching the plate in the acid batch and cleaning off the ground with mineral spirits, I had a clean zinc plate with tiny grooves etched into it. 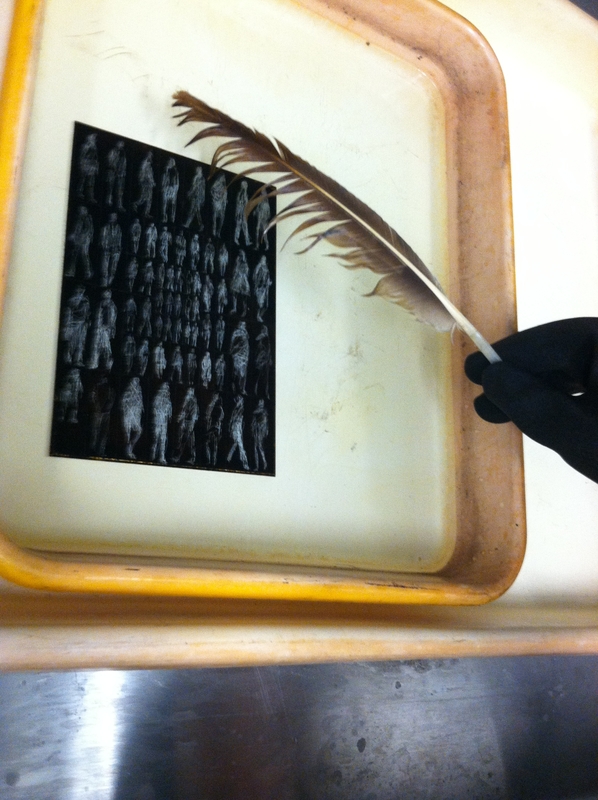 This was covered in ink and then carefully wiped off, leaving ink in the grooves, but not on the surface of the plate. I then set a piece of paper on the plate and ran it through a very tight press, pushing the fibers of the paper into the inked grooves, and wa-lah! 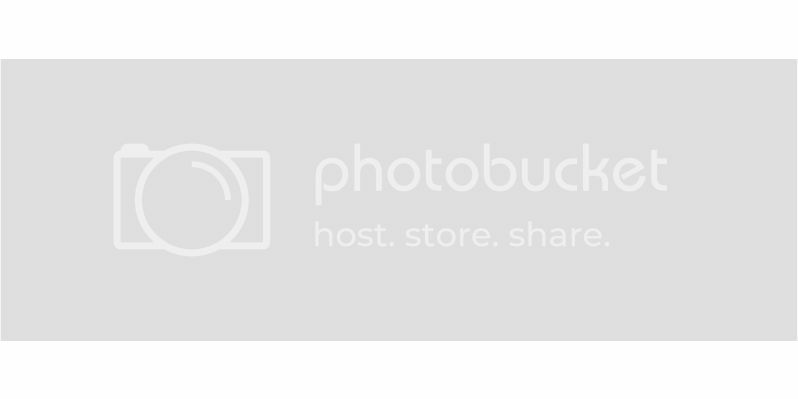 — the image you see at the top of this post. It all sounds simple enough, but it does take time, especially while you’re inking and wiping the plate prior to printing. You can only run the plate through the press once, for a single print, and then you need to ink and wipe again, which takes at least ten minutes. Whenever you finish printing, the plate can be cleaned with mineral spirits and stored until you’re ready to ink-wipe-print again. I have two more days in the printmaking studio at Golden West College here in Huntington Beach, and I plan to use them experimenting with different inking/wiping techniques. For my first proof I left a lot of “plate tone” to give it a must old-fashioned look, and I want to see what a print will look like if I wipe a little more for a cleaner image. If any of you have etching experience, let me know if you have any suggestions. If you don’t, I wonder if my description of the process made sense to you — it’s all pretty easy if you’re doing it. Feel like you know how it works?